All parties involved share responsibility for the failure of negotiations and the escalation of violence in Ukraine. Odessa, Ukraine—The Ukrainian government and the president certainly have much to answer for. They permitted radicals to build a heavily armed encampment smack in the very heart of the nation’s capital and in violation of three separate court orders, all just a few yards away from the main government buildings. They have repeatedly given in to the intimidation of roving bands of armed and masked hooligans who, having now become a law unto themselves, endanger the lives of peaceful citizens. Just before the most recent spate of violence, during the “peaceful” interlude that followed the president’s last amnesty offer, for example, law enforcement officials stood by as a civic initiative known as “Kievans for a Clean City” was brutally assaulted near the Maidan. The parliamentary political opposition (Yatsenyuk, Klitschko and Tyahnybok) also has much to answer for. Its contempt not just for the current constitution but for the parliamentary process itself, as manifested by its routine seizure of the Speaker’s podium to prevent parliament from functioning, has only further weakened and discredited the political process. With power seemingly within reach, it has relied on ultraradical and openly neo-Nazi groups to achieve the kind of political control that it probably could not achieve through the ballot box. After all, just as the views of the political opposition have hardened with the escalation of this crisis, so have the attitudes of the supporters of President Yanukovych’s party, the Party of Regions, which remains the largest in the country. By carelessly embracing the slogan of revolution, however, it has unleashed forces that it is now powerless to control. Finally, those Western governments which have taken it upon themselves to intervene in Ukraine’s internal political drama also have much to answer for. Their undisguised bias against the popularly elected Ukrainian government and insistence on mutually exclusive demands—protect freedoms and defend the rule of law, but do not defend freedoms and the rule of law if force must be used—has enervated the government, emboldened the opposition and given the most radical elements a free hand to create mischief. By failing to insist that the political opposition distance itself from the radicals, Western policies bear part of the responsibility for the escalation of violence. There is, however, little sign that anyone in the West is actually listening to average Ukrainians, who are fed up with the current violence. More often than not, political officials, pundits and editorial boards cling firmly to their initial assessments of the unrest as a “tug-of-war” with Moscow, and remain oblivious to the danger that rise of violent nationalism on the wave of popular discontent with the government poses to Ukrainian democracy and national unity. One reason for this is simply amnesia. Four generations have passed since fascism rose to power in the heart of Western Europe, sweeping aside the weak and ineffective popularly elected governments. It seems implausible for such a thing to happen in Europe today. Understandably, Europeans would much rather dwell on how postwar fascism in Italy, Spain and Portugal gradually became reconciled to the basic principles of liberalism and constitutional democracy, than to accept the idea that they are witnessing a slow-motion replay of the March on Rome organized by Italian fascists in 1922. But the single most important reason Western governments cannot see the dangers to democracy in Ukraine is the assumption that simply by being against Russia one must at the same time support democratic values. For the United States, in particular, this is a recurring theme. During the Cold War the United States often provided crucial assistance to “friendly fascist” dictatorships in its struggle to prevent the expansion of Soviet communism. So today, even though communism is no longer a threat, and Russia is calling upon all parties to let Ukrainians sort out their own issues without external interference, many in the West continue to act as if the major problem in Ukrainian politics is Russian involvement. Of course, Russia’s deep cultural, linguistic and religious ties with Ukraine cannot be overlooked, but this only makes the absence of Russian politicians in Kiev during the current crisis stand in sharp contrast to the daily pilgrimages there of European and American emissaries. Western policy has lost touch with reality in Ukraine because it is Russia, not Ukraine, that is its real focus. Simply put, Western policy has lost sight of Ukraine itself. What needs to be done to get Ukraine back into focus? First, stop talking about “the Ukrainian people” as if it were a monolithic concept. Two closely related, but distinct, cultural heritages comprise Ukrainian identity—Ukrainian and Russian. Attempts to isolate, ignore or minimize the importance of the Russian cultural component of Ukrainian national identity, to which more than half the population give some allegiance, can only lead to more political conflict. Second, stop trying to force Ukrainians to choose between Europe and Russia. Every survey indicates that this is a choice that people do not want to make. A broader view of European identity, one that accepts Russia as part of Europe, would be the one with the most appeal in Ukraine today. Such a tripartite approach (Russia-EU-Ukraine), previously suggested by Russia, Ukraine, as well as several former European leaders, is exactly what is needed right now to break the stalemate between the government and parliamentary opposition, and wean the latter away from its unhealthy dependence on the far right. Currently, the parliamentary opposition’s dilemma is that it cannot distance itself from the radicals without losing credibility as a force for real change. But if all of Ukraine’s major foreign partners were to present a united front, and insist on a coalition government that excluded the extreme right, the only ones left out in the cold would be the extremists. Finally, stop regarding Ukrainian politicians as proxies for Russia, and Ukrainian politics as a battleground with Russia. Stop taking sides on domestic political issues based on simply on whether or not it is perceived to benefit Russia. Stop referring to the country’s most popular political party, the Party of Regions, as “pro-Russian.” It is not. Its members are just as staunchly pro-Ukrainian as their erstwhile political opponents, with whom they disagree over many issues, including the benefits of signing the EU Association Agreement. In sum, we need to take a more complex view of Ukraine, rather than filter it through how we view Russia. 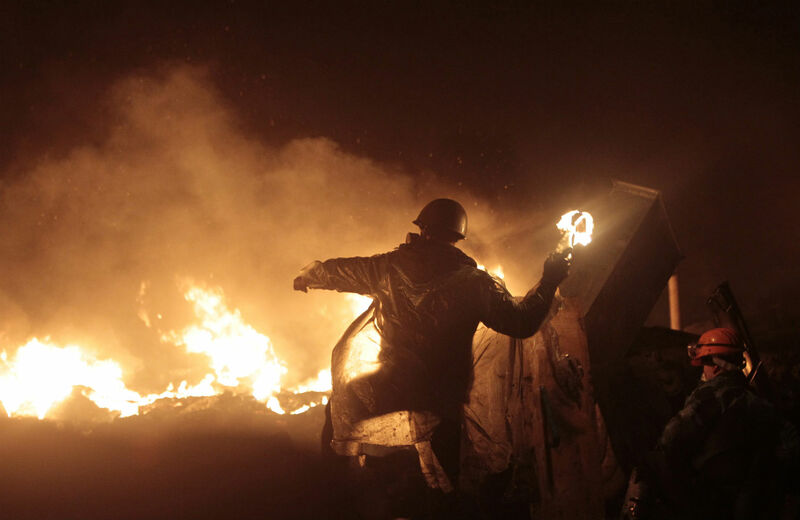 Ukraine’s current trajectory is leading the country toward a divide. At best, this divide will leave profound scars in the body politic that will take decades to heal. At worst, it could still result in a physical divide. The agreement signed between the government and the political opposition is promising, but it has one potentially fatal flaw—it does not address the problem of what to do with the extreme nationalists who have won for themselves the reputation of being the uncompromising spearhead of the revolution. The containment and disarmament of these extremists now needs to become the first order of business for any government of national unity. The success of the peace rests upon this, more than upon anything else.